Saturday August 14th 1897 I was busy all forenoon with baking and sweeping. Will went to town. Aunt Em & Mr Whetstone with cousin Willie, Anna, and little Marjoire were here for supper. Sunday August 15th 1897 We went up to Woolfs before noon. The girls were both home. We had a good visit and stopped at the home place on our way back. It was a cool windy day. Monday August 16th 1897 Will brought me in some corn to day and churned for me in the forenoon. I put up a few jars of apples in the afternoon and went over to see the girls a little while. 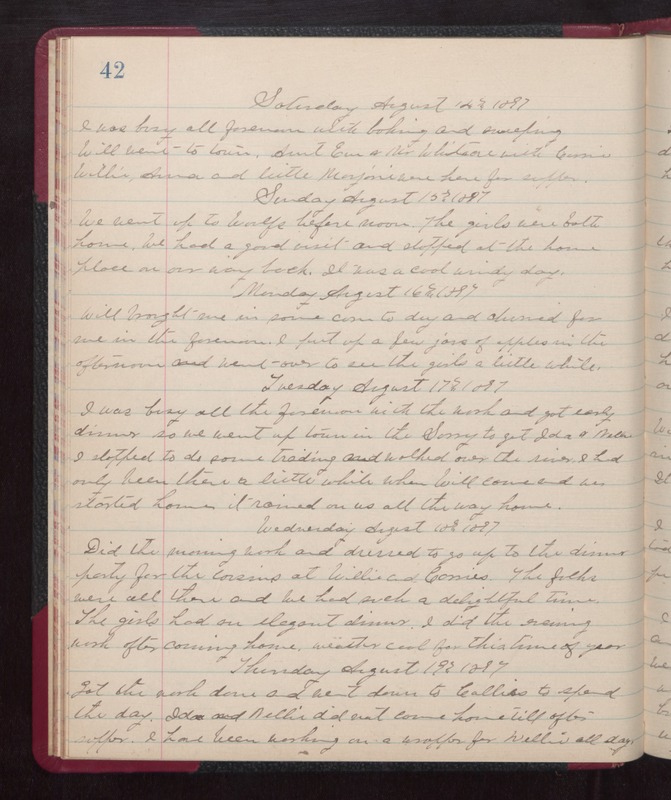 Tuesday August 17th 1897 I was busy all the forenoon with the work and got early dinner so we went to up town in the Surry to get Ida & mother. I stopped to do some trading and walked over the river. I had only been there a little while when Will came and we started home. it rained on us all the way home. Wednesday August 18th 1897 Did the morning work and dressed to go up to the dinner party for the cousins at Willies and Carries. The folks were all there and we had such a delightful time. The girls had an elegant dinner. I did the evening work after coming home. weather cool for this time of year. Thursday August 19th 1897 Got the work done and went down to Callies to spend the day. Ida and Nellie did not come home till after supper. I have been working on a wrapper for Nellie all day.